This is a KinemeCore request. A patch that can be placed in far away places in a comp and have a keyboard shortcut assigned to it. 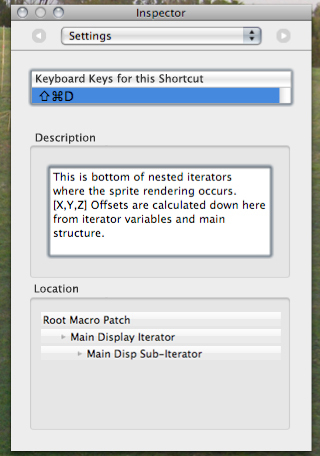 Typing the keyboard shortcut will take the main Editor window to the location of the short cut. I've showed the data as being enter as settings but I know we all prefer the settings exposed as inputs, just not sure if the Keyboard Modifiers+alphanumeric key can be done that way, sounds hard to me. Could reserve a modifier like control key for directing the second editor (instead of main) window with otherwise same shortcut too. The patches could broadcast to a Bookmarks menu or sub-menu in the K menu is another alternative. This would take me to my favourite place from far-far away (and vise-versa) in one effortless stroke, please consider. Cool. We've been talking about putting together an alternate (hierarchical) composition navigation system, and bookmarks/shortcuts would fit in nicely with that. As usual it's just a matter of finding the time to do everything..
Well I've been sitting on the bookmark patch for at least a year so I can wait a day or too longer ;) The stuff you've been working out sounds intriguing. Time: yeah, I've spent more time on kineme.net following threads I can't understand (eg. OpenCL) than in QC lately… somethings gotta give. If we had a hierarchy browser that was ala the plist (organization wise), is it a technical possibility to click on a patch in the plist/hierarchy browser, and have the editor center on that patch at that moment? I never noticed that it did that when I was inspecting the performance! at least, I think it did -- I know if you double-clicked a patch, it'd take you to it. Same/similar kind of functionality. Yeah, it's a shame it didn't work to port that to SL. It was a good one. Using SL makes me forget to use it when I'm in Leopard. I prefer the concept of that (which as you state, already has existed), as opposed to an actual patch that one would place on the editor (that would have to evaluate?). Could it be possible to add metadata/Notes from the Editor to a hierarchy display like that, and do a similar thing? That would allow one to make arbitrary spots, and not even need a patch. I do like the whole marking with keyboard click thing that usefuldesign brings up though... but I wonder if it could lend itself to conflicts in what one may have an actual keyboard patch doing in the composition, vs. what gets triggered in the editor. Well, that's always an issue with shortcuts in any app, isn't it? InDesign has as many shortcuts (factory-set) as any App I can think of so setting shortcuts for Para (text) Styles and so on you end up using Ctrl-Keypad-1 etc etc just to avoid shortcut conflicts. If the patch-hierarchy or list-of-notes way of doing this could populate a Menu-bar level menu then it would be easy enough to using Sys prefs…>Keyboard to assign shortcuts. I always find it a hassle doing it that way as opposed to Apps that have shortcut assigning functionality within the app though — so I prefer it's all handled in KinemeCore itself in some kinda way. Force hierarchy broswer to come back ?